Step out into the garden, and the countryside beyond at the moment, and you’ll find snowdrops doing what they do best in January – piercing the barren earth, colonising grassy patches, nestling under trees and marching across gladed hillsides. Untroubled by unseasonal weather, their inner clocks direct them to grow, multiply, and cheer us all up in an otherwise gloomy, un-festive sort of month. That’s Nature for you: ordered, seasonal and predictable. A farmer’s field? Or Sleningford-by-the-sea? But Nature has another face. Come with me beyond the garden, past the fields slickly shimmering with surface water, to the banks of the River Ure. Just two minutes walk from here, it makes a wide sweeping curve away from its route from West Tanfield, and (normally) meanders gently into Ripon. That was before this winter, this rain, this unending water. Once the rains came, and once it reached town, the River Ure rather wanted to swamp people’s gardens and make a bid to enter their houses. Recently-built flood defences put paid to that idea. The River Ure took its revenge on us, or more specifically, on the farmer whose fields adjoin us. Up in the hills, waters from streams and rivulets in the Dales cascaded into the Ure, which gushed and surged along its course, rising higher and higher, tearing at the banks, ingesting great clods of earth and forcing them downstream. The water levels are falling now. The damage remains. The River Ure seizes the land. Look. Here’s a chain link fence which marks a pathway running along the edge of the farmer’s field. It should be on terra firma, with a nice grassy margin between the fence itself and the river bank. Now it has nothing to hold onto. The bank has been snatched away, and the fence is hanging crazily and directly over the swelling waters below. The earth has slipped, and continues to slip. The farmer is losing his field, and the river is changing course. There’s not much anybody can do about it. We’ll watch the water awhile, and frighten ourselves witless at the prospect of falling in and being swept mercilessly away. Then we’ll wander back though the woods, and enjoy the snowdrops and aconites once more. Nature takes its course. The steps through the woods. A post for a fellow-blogger. I’m at university this week. The University of Blogging. This seat of learning, which has no rector, no library and confers no degrees, runs a programme regularly hosted by WordPress,and aims to bring together people who from all over the world, keen to hone their writing and presentation skills, and to help each other to Write a Better Blog. Publish a post you’d like your ideal audience member to read. I’ve chosen to write for one of you. We haven’t met. We don’t live on the same continent. But we’re ‘blogging friends’ who enjoy one another’s posts and often say so. You say you like the posts I write about walking in the Yorkshire Dales. I like the posts in which you too describe your walks, often more extensive than mine, taking place over several days. You stride beside me – virtually of course – as I tramp along the leaf mould paths of a dappled English woodland. I stop to gaze across the green and undulating hills at the lattice work of ancient fields, divided by drystone walls, and share the view with you courtesy of my camera. Except… I haven’t. Not lately. Those floods I wrote about a couple of weeks ago are an ever-present danger to some. And even for those who haven’t had flooded homes to contend with, the weekly rhythm has changed. Walking is quite simply not on. The other day, fed up with the lack of exercise, I took myself off to walk along country roads instead. I’d not been going ten minutes when I met a deep trough as wide as the road, as deep as my ankles, and as long as… well, I don’t know. It went beyond the next bend, anyhow, and I went home. The fields are home to seagulls who bob about on the choppy waters. The paths are streams. The streams are rivers. And the rivers are seas. Quiz question. Which is the path, and which the brook? Brian can’t wait to get home. i) Quiz question: which is the path, and which the brook? ii) This, I’m afraid, is a path. iii) Brian-from-Bolton simply can’t stand getting his paws muddy. He’s urging me home – NOW. But I’m keen to get out and about again as soon as I can. And I hope you’ll come with me, in a virtual sort of way, when I report back. A typical field. And not half as bad as some. Author margaret21Posted on January 7, 2016 January 7, 2016 Categories North Yorkshire, Walking, WeatherTags Walking, Yorkshire Dales14 Comments on A post for a fellow-blogger. We were staying with my daughter’s family in that part of Greater Manchester that used to be in Lancashire. They live near a Nature Reserve through which Bradshaw Brook passes. I’d say ‘flows’, but such a phrase is normally far too active a description for this narrow little watercourse. This was Bradshaw Brook yesterday. We were due to travel home from their house to ours, in Yorkshire. Highways England, the BBC, and motoring organisations all had conflicting information on their websites. But they all agreed that our usual route, a scenic drive over the Pennines, was largely impassable. It would have to be the motorway. Longer, duller, but surer. We’d not long been travelling when we noticed that traffic on the other carriageway was at a complete standstill, for miles…and miles. It was only when we got home that we found out that a 20′ sinkhole had opened up near Rochdale. So much for safer-by-motorway…..
Where to leave the motorway though, for the final few miles home? There were floods in Leeds, floods near Harrogate – there were sure to be floods in Boroughbridge too. What about Knaresborough? It turned out there were floods near there too, as we discovered when warning notices turned us back on the road we’d come on, and sent us back by several miles to look for another route. Familiar fields had turned into lakes, deep and almost unfordable road-side puddles were unavoidable. This doesn’t look too bad. Trust me. It’s deep. We’re lucky. We were flood-tourists on our journey home, gawping at rivers-become-seas, and roads-become-rivers. Our home wasn’t flooded, nor will it be. Others aren’t so fortunate. They’re either contemplating the devastation of their own home or business – or both, or anxiously shoring up the front door with as many sandbags as they can lay their hands on, in anticipation of the days ahead, when the forecast continues to be grim. We could all do with a bit of an old-fashioned winter cold snap, with a touch of frost, but positively no rain. You see that bridge, centre left? That’s a bridge over the River Ure, in Ripon. This lake in the foreground is not a lake, but open ground at the edge of the city, favoured by dog-walkers and children. In which Saint Swithin fails to keep his promise. 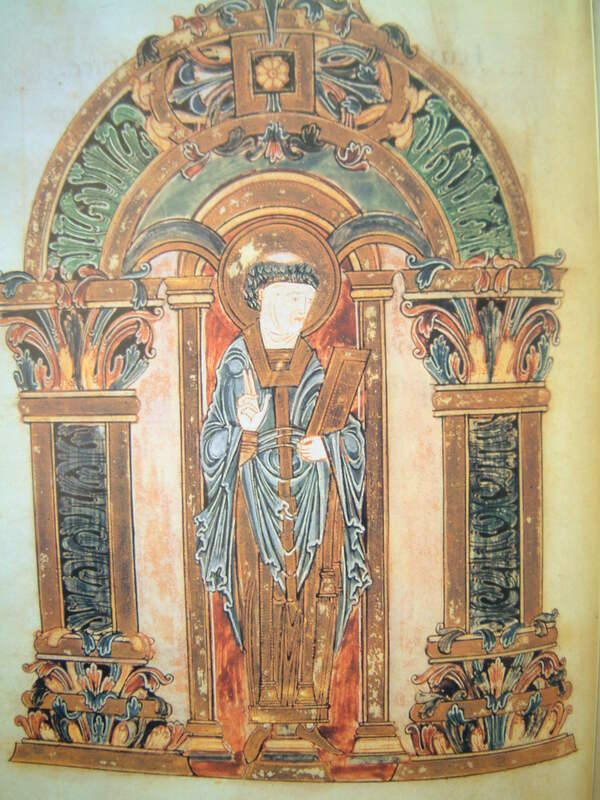 It was Saint Swithin’s Day last Wednesday (15th July). I thought everyone knew that. But when I mentioned it to a group of younger people I was chatting with that morning, they looked at me with blank incomprehension. Yes, apparently the weather we get on Saint Swithin’s day is the weather we can expect for the next forty days. Nobody really knows why this blameless 9th century Bishop of Winchester is responsible for his apparent hold over the climate in high summer. He seems to have been a nice chap. He held banquets to which he invited the poor, not the rich. He miraculously restored a basket of eggs that workmen has maliciously broken. He asked that on his death, he should be buried outside the cathedral, rather than inside, so that passers-by would tread on his grave, and so that it should be regularly watered from the skies. But in 971, he was moved to a new indoor shrine. And lo! The heavens opened. Perhaps this is where the legend originated. But it has a measure of truth. Round about mid July, the jet stream settles into a pattern that holds good until round about the end of August. Not this year. Saint Swithin’s day was pretty good: warm, fresh and sunny. 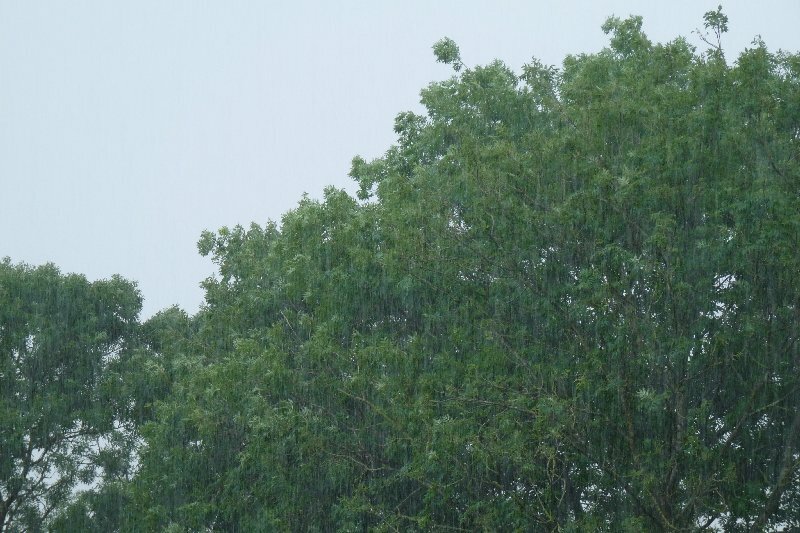 Since then though, we’ve had cold days, hot days, or like this morning, woken up to driving rain. As this picture sort of shows. Looking out of the window at breakfast time today. Here are some pictures of a walk I took yesterday, a day on which Saint Swithin kept his promise made on Wednesday. It was a day of high summer, with the crops ripening fatly in the fields, the verges crammed with tall plants that often obscured the view, and a warm refreshing breeze in the air. That’s what Saint Swithin is supposed to deliver. He’s got some 36 days left to remember to keep his promise – every day. The tall wayside plants of high summer. A bird-hide in the woods. The last of the poppies. Cows at rest during a hard day in the pasture. Author margaret21Posted on July 19, 2015 July 19, 2015 Categories WeatherTags weather10 Comments on In which Saint Swithin fails to keep his promise. Life on the Ocean Wave? We’ve just come back from a fortnight or so in England – To Be Continued in our Next. I just need to get our journey off my chest. We generally cross the Channel by ferry. 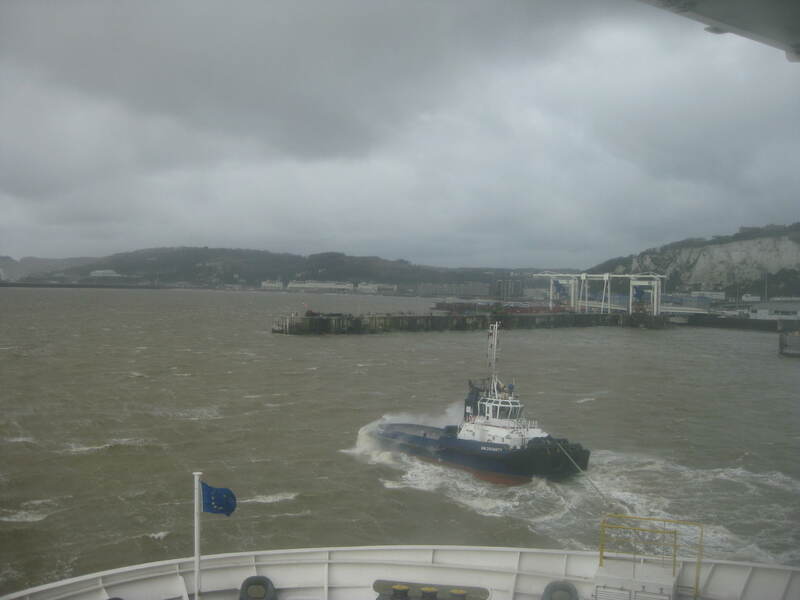 Neither of us is keen on the Tunnel, and a nice breezy trip on a boat always seems a cheery, day-out-by-the-seaside way of travelling between England and France. Why not go down to the port, then, and see if the ship before had been delayed, and whether it could perhaps squeeze us in? Down at the booking office, the news was that because of atrocious weather, the 6.30 a.m. sailing still hadn’t been able to leave. But it was loading, but if we hurried, we could go too. We hurried. We caught the ferry. We regretted it. Even behind the harbour walls, the ship was pitching and tossing. As we started our voyage, the well-named tug DHB Doughty struggled to keep us on some kind of suitable path between the harbour walls. Out among the waves and spray of the open sea, the ship immediately started to lunge, roll, and sway, and kept up this uneasy surging throughout the trip. I’ve always been a rotten sailor, but told myself firmly that this time it would be different: it was just a case of mind over matter. Less than 10 minutes later I was sick for the first time. 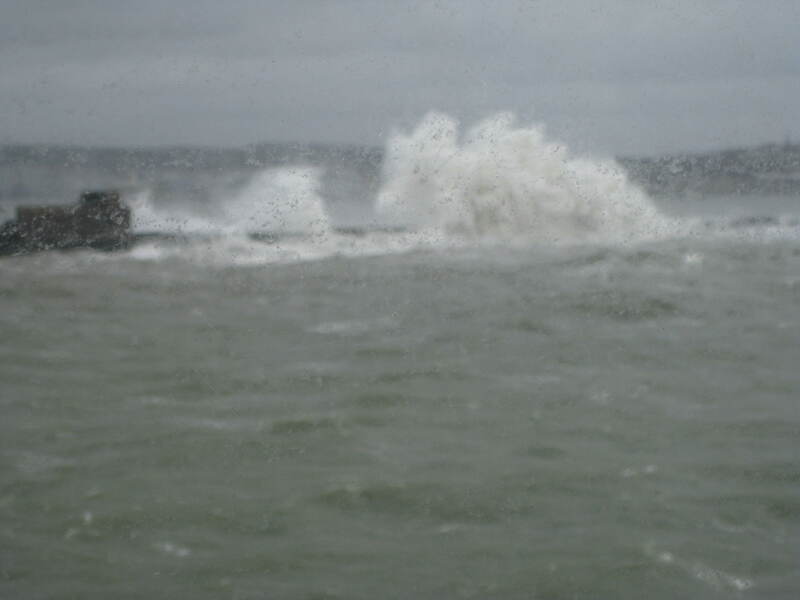 The photos show the sea hitting the harbour in Boulogne. That’s the sea as it lost power and hit the coast, not the raging sea we’d been putting up with in what felt like mid ocean. For six long hours. Next time there’s a storm, I ain’t sailing. I’ll just sit it out on dry land. 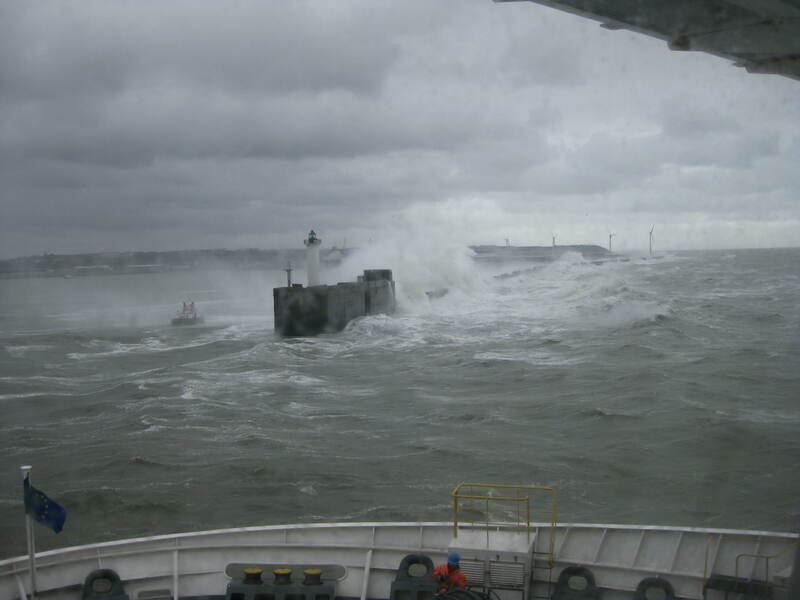 Author margaret21Posted on April 2, 2010 April 9, 2018 Categories WeatherTags Boulogne, Dover, English ChannelLeave a comment on Life on the Ocean Wave?